Through work and general drinking around town I’ve met a lot of rather excellent people, and sat at the top of that pile is Ryan Chetiyawardana (who I keep forgetting to ask about the pronunciation of his surname). He’s been doing the cocktails at The Whisky Show for the last couple of years, but I first heard his name mentioned after he won the UK leg of Diageo’s World Class bartender competition in 2009. He was at Bramble (my favourite cocktail bar in Edinburgh) then and after stints at 69 Colebrooke Row and The Worship Street Whistling Shop is now out on his own, doing pop-ups and events as Mr Lyan. I’ve sadly not kept up with my sherry education over the last couple of years and on telling Ryan this a few months back he pointed me at Trangallan, a Spanish restaurant on Newington Green that has an incredible sherry selection, much not otherwise found in the UK and lots of it available by the glass. It went on my ‘to visit’ list but had yet to get to the top when I received an email asking if I’d like to come along to a preview of a pop-up that Ryan was running at the restaurant – a night of Spanish food, sherry, whisky and cocktails with Trangallan, Gonzalez Byass, Dalmore and Mr Lyan. I said yes. Obviously. The night was to be a sample of what they will be offering at the full pop-up, with more food and drink on the table for the real thing. The over-arching conceit for the pop-up is to show off all four elements on their own and combined, with food and drink pairing as well as cocktails designed to compliment the flavours in the neat drinks. Ryan’s pulled in some of his cocktail making friends to help develop the drinks and was joined on the night by Iain Griffiths, another Bramble alumnus who has recently arrived in London from Edinburgh. 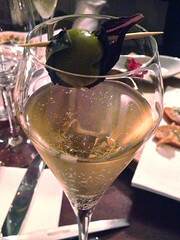 We started with a glass of Tio Pepe, Gonzalez Byass’s regular evening starting sherry. It’s the best selling Fino sherry in the world, well-priced and a good benchmark. It’s crisp and dry, with lemon, green grass and a light nutty, yeasty character. It’s not overly complex and works well as a palate cleansing aperitif. To accompany our first round of dishes Ryan and Ian produced a sherry based cocktail, a mix of Tio Pepe and apricot brandy, fizzed up in a cream whipper with a vanilla pod and garnished with an green olive wrapped in basil (purple or green). At first it was cloyingly peachy but that quickly balanced out with the dry and sour flavours of the sherry cutting through, along with the creamy vanilla. As it warmed up candied fruit flavours appeared and, quite surprisingly, a combination of pear drops and real, ripe pears. 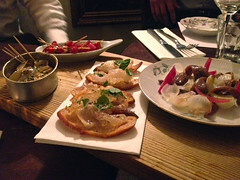 The food started with some small plates to share, with four dishes to choose between – Banderillas (pickles onna stick), Lardo crostini (pork fat on toast), cockles, and smoked anchovies with picked onions. The thick fatty flavour of the lardo and the pickled edge of the other dishes cut through the heavy sweetness of the cocktail, while the dryness of the Tio Pepe, which I managed to save a few sips of, worked well to reset the palate between bites – the sushi ginger of the tapas world. Our next sherry was one I’ve been wanting to try since I head of its existence – Tio Pepe En Rama. Four years ago the folks at Gonzalez Byass, watching sherry sales to continue to slump, decided to try and put out something a bit different. They settled on En Rama, the term used to describe sherry straight from the casks – ‘raw’, a limited edition unstabilised, unfiltered sherry. As it’s not played with too much after leaving the cask it’s got a short shelf life, needing to be drunk within three months of bottling – this year’s was bottled on April 3rd so we tried it about 2/3rds of the way towards its BBE date. I’ve not managed to get any of it so far, partly due to me being quite crap at keeping up with when it goes on sale and also due to it being quite a limited release, with about 11000 bottles hitting the market this year. Thanks to the remaining sherry geeks (there are still a few) and the resurgence in popularity amongst wine buffs it sells out pretty quickly, but with other producers now releasing En Rama wines there’s a bit more chance of finding something similar. On the nose it had pungent grass, hints of the farmyard and nuts. There was also a yeasty, cheese rind mustiness. To taste it was very grassy with an unexpected underlying sweetness, sour grapes, straw and more of the musty rind. It finished with a tart lemon zest tang. Simply put, it was Tio Pepe but more so, as you’d expect. It seems that it’s been a mild and damp winter and spring this last year in Jerez, which has helped the flor (the mat of yeast that sits on the surface of Fino style sherries, keeping air from contacting the maturing wine) grow, adding more of the yeasty character. I suspect I’ll be seeking out a bottle of the 2014 release. 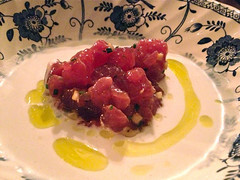 The En Rama was accompanied by a courgette salad and a pair of fish dishes – tuna tartar with ajoblanco, and scallop Sashimi. Again the wine went well, cutting through the richness of the ajoblanco (almonds and garlic ground into a dairy free, creamy soup) and not overpowering the fresh, thinly sliced scallops. The surprise star of the show was the salad, with chunks of courgette (one of my least favourite vegetables) tasting almost melon-like. It sat on the table for the rest of the meal, picked at for a bit of fresh vegetable accompaniment for the following dishes. Next on the drinks list was Gonzalez Byass’s ‘young’ palo cortado – Leonor. This is a mere 12 years old, in comparison to the 30 years that it takes for their Apostoles palo cortado to make its way through the soleras. Leonor is the precursor to the Apostoles, being bottled at the point where the maturing wine is usually blended with some PX before being moved into the Apostoles solera for its final bout of ageing. This was served with our ‘main course’, although in a meal that’s lots of small plates that’s probably not an appropriate description. 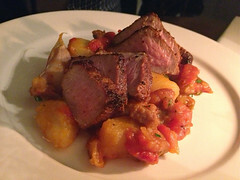 We were presented with salt cod ‘tripe’ with peas, and pork loin with a potato and tomato sauce. Both were impressive: the pork had a smoky crust, was pink in the middle and was full of porky flavour, with the sauce adding a spicy and fruity zing; the tripe (actually the swim bladder of the cod) was rich, earthy and lightly fishy, and the accompanying peas bobbed around in the gloopy sauce providing a nice veggie-ness while not being too sweet. The sherry also did well, having enough sweetness to stand up to the cod but not so much as to clash with the tomato sauce. We then moved on to the cheese course, accompanied by a glass of Matusalem, Gonzales Byass’s old oloroso. 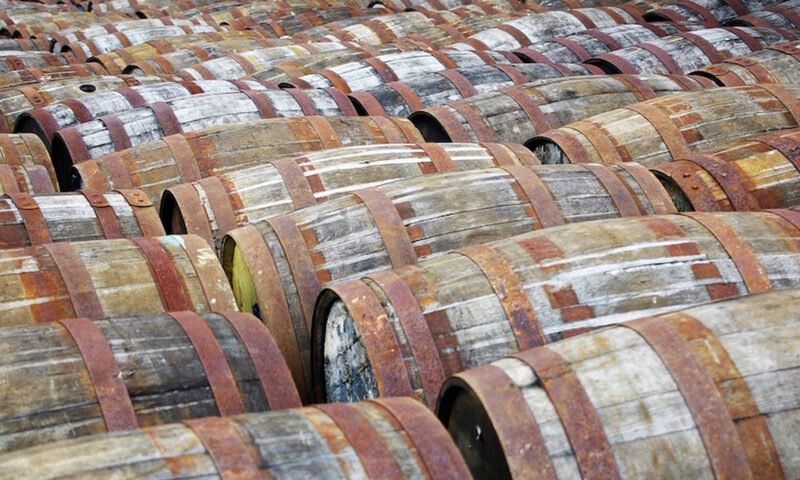 Made with some PX in the mix for sweetness and aged for 30 years it’s also well known to fans of Dalmore as one of Richard Paterson’s favourite casks for maturing their whisky. On the nose it had cherries and cocoa, a hint of menthol and some raisins. To taste it was thick and sweet with a woody dryness balanced by the cherries and menthol from the nose. It finished with lingering berry sweetness and a touch of grain. We were also presented with a glass of Dalmore King Alexander III, a whisky finished in a variety of casks including a core (50-60%) from Matusalem barrels (also bourbon, port, madeira, marsala and cabernet sauvignon). On the nose it had chocolate and nuts, both flesh and shells, toffee, touches of spiced raisin and some vanilla. To taste it was spicy with less sweetness than I was expecting, with caramel and dry raisin notes. It finished with polished wood and woody liquorice. The cheese was a rosemary crusted Zamorano, produced in the next province along from Galicia, the home of the restaurant’s cuisine. 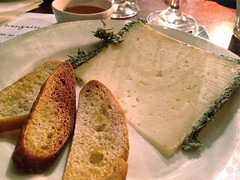 It’s very similar to Manchego, but produced in Zamora rather than La Mancha using milk from a different breed of sheep. It was quite creamy and nutty, with a bit of parmesan pungency and some nice sour rosemary notes as you nibbled closer to the rind. It was served with a pot of honey which brought out more of the ‘cheesy’ notes rather than the creaminess. Both whisky and sherry worked surprisingly well with the cheese, with Kai Reeves, Whyte and Mackay’s representative at the dinner, quite please as he was more used to pairing the King Alexander with chocolate. The dry nutty notes in the whisky matched up well with the nuttiness of the cheese while the sweetness of the Matusalem was tempered somewhat by the creaminess. We moved on to our final course and our final drink of the night – a cocktail made to show off the flavours of the Dalmore 15 year old. It was a mix of Dalmore 15, Amer Picon, tawny port and honey water. The result was quite impressive, with the key flavours of the whisky picked out and amplified by the other ingredients – it has some orangey notes, sweet honey, and some heavy wine notes thanks to the three years of finishing in Matusalem, Apostoles and Amoroso (which as far as I can tell is a style which Matusalem is an example of – oloroso sweetened with PX – if anyone knows more please let me know…) casks. Proportion-wise it’s 4/5ths whisky, with the other ingredients being added to make up the last fifth – it totally transforms the whisky while still keeping its flavour at the core, and is rather impressive. 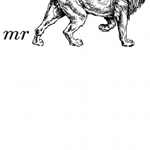 Good work by Geoff Robinson of Happiness Forgets, an absent part of the Mr Lyan gang and the guy behind the recipe. Along with the cocktail we were presented with a trio of desserts – a rich chocolate ganache with sea salt and olive oil, strawberries with basil and cream (on the menu because chef Eddu’s dad was visiting and he’s a big strawberry fan), and a flan de huervo (egg tart – creme caramel with more of an eggy hit). They were all rather tasty, although the egginess of the flan didn’t go with the cocktail particularly well, with a hit of anis-like herbiness in the strawberry dish, and the combination of olive oil and chocolate in the ganache both being quite different and effective. All in all a successful evening, even if sitting around chatting with the guys afterwards meant that I played a game of last bus and tube tag across London to get home. They’re taking bookings now for the pop-up, with three sessions a night on Thursday 6th, Friday 7th and Saturday 8th June. You can find details over on Trangallan’s website. Thanks to Ryan for inviting me along and to the folks at Trangallan for putting on such a good spread of food. Kai from W&M kindly endured me talking all night before presenting the whiskies and Andrew Sinclair (the man to blame for my current love of sherry) was on good form introducing the wine. I was a guest of the house for the evening but I’ll be back for the main pop-up, if I can find a space in both my calendar and their booking list… Update: I’m going on Friday. Yay! @BillysBoozeBlog @LyanBar @Trangallan_N16 Interesting that I didn’t even notice!